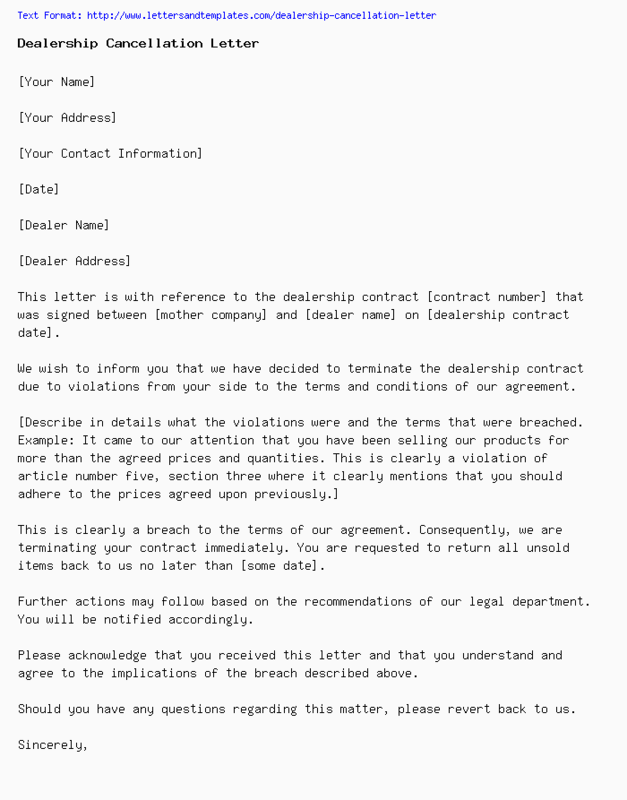 This letter is with reference to the dealership contract [contract number] that was signed between [mother company] and [dealer name] on [dealership contract date]. We wish to inform you that we have decided to terminate the dealership contract due to violations from your side to the terms and conditions of our agreement. This is clearly a breach to the terms of our agreement. Consequently, we are terminating your contract immediately. You are requested to return all unsold items back to us no later than [some date]. Further actions may follow based on the recommendations of our legal department. You will be notified accordingly. Please acknowledge that you received this letter and that you understand and agree to the implications of the breach described above. Should you have any questions regarding this matter, please revert back to us.